Simon Heath, the man behind the immense Atrium Carceri has been very busy indeed with his main project and this. On top of this he started the Cryo Chamber label up after the end came for Sweden’s CMI; a label with which he had found a home for his musical output. Over the course of three tracks spread over three CD’s he brings three albums that were released previously on digital download. I despise digital only releases and I am pleased to see this as a hard copy and a worthy purchase that is value for money and as a product, to marvel at over three discs. 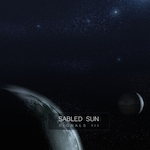 As expected, Sabled Sun provides an epic concept tale, narrated in rich, driving Dark Ambient in three stages. Comparisons have to be made with Heath’s other output from his Carceri project as this sits within the same genre; and some of the time it is hard to distinguish between the two, which I guess I to be expected, even if I am nit-picking. Sabled Sun however, goes for the long haul and to swallow this whole release up, you will need a good three hours of your time along with some contemplation space, to boot. ‘Signals II’ is my favourite, where a lot of the pads resonate in the same way as Sophia managed on the incredible ‘Herbstwerk’; massaged into the ears with enriching, underwater-like bubbles of sound. Individually, these ‘Signals’ releases are a great example of the genre in their own right. However, place them together and they collide as a truly monolithic release of grand proportions that should and most definitely will, be lapped up by any self-respecting Dark Ambient fanatic. This entry was posted in Cryo Chamber, Tesco Distribution. Bookmark the permalink.